The Proterozoic Belt Supergroup contains evidence of possible microbial mat and dome structures similar to stromatolite reef complexes. ^ Schieber, Jürgen (1998). "Possible indicators of microbial mat deposits in shales and sandstones: Examples from the Mid-Proterozoic Belt Supergroup, Montana, U.S.A." (PDF). Sedimentary Geology. 120 (1–4): 105–124. doi:10.1016/S0037-0738(98)00029-3. 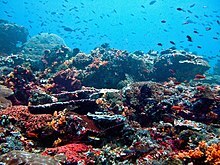 Wikimedia Commons has media related to Reefs.